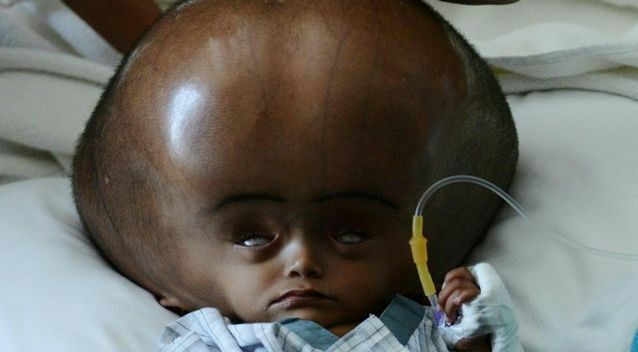 An Indian girl who made international headlines when a rare condition caused her head to swell to more than twice the normal size has died, days before she was to undergo corrective surgery. Roona Begum's family said she died Sunday at her home in a village in India's remote northeast after complaining of breathlessness. "She was otherwise fit and fine. But on Sunday she started having breathing problems and I rang up my husband asking him to come back home," said Fatima Begum. "He rushed home and gave her water but before we could take her to the hospital she died," she told AFP. The five-year-old was born with hydrocephalus, a potentially fatal condition that causes cerebrospinal fluid to build up on the brain. Publication of pictures taken by an AFP photographer in the remote state of Tripura prompted a New Delhi hospital to treat her for free in 2013. Her condition caused her head to swell to a circumference of 94 centimetres (37 inches), putting pressure on her brain and making it impossible for her to sit upright. After several round of surgery at the Fortis Hospital, her head circumference shrank to 58 centimetres. Pictures showed the distraught parents sitting next to her body, wrapped in a cream towel as her younger brother looked on.